Oia and Amoudia in Santorini. Accommodation. Beaches. Oia, or Ia as the village is pronounced in Greek, is located on the far north of the island about 15 kilometres from Fira. The village was partly destroyed by an earthquake in 1956 and has not been built up fully yet. The architecture is absolutely stunning and the houses are painted in all the colours of the rainbow, even though white dominates. New houses are built so close to the cliff edge as possible despite the earthquake risk. Oia, or Ia as the village is pronounced in Greek. The port of Amoudia down to the left. 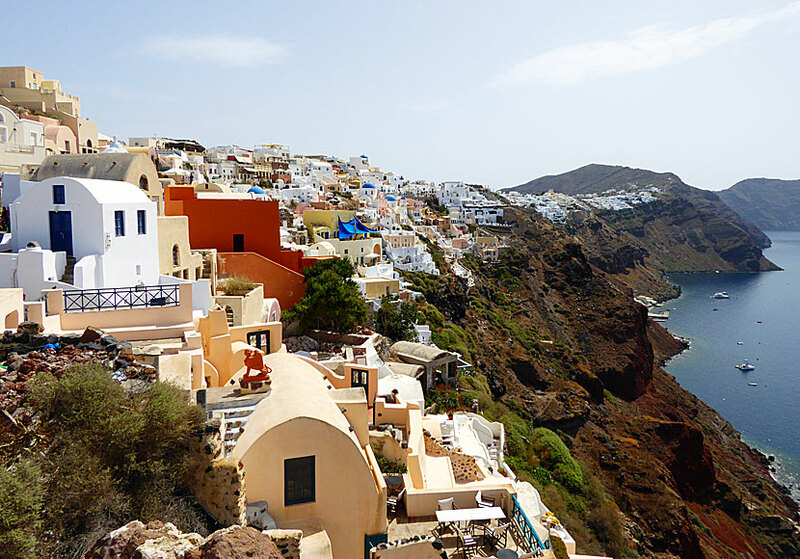 Oia is one of the most beautiful villages I've seen. If I close my eyes to all trade, I might point out, because that is how it is, the trade is in full swing also here, but it does not feel as palpable as in Fira. Oia stands for culture, not kitsch, there are many art galleries and craftsman, and classical music is mostly played at the taverns. 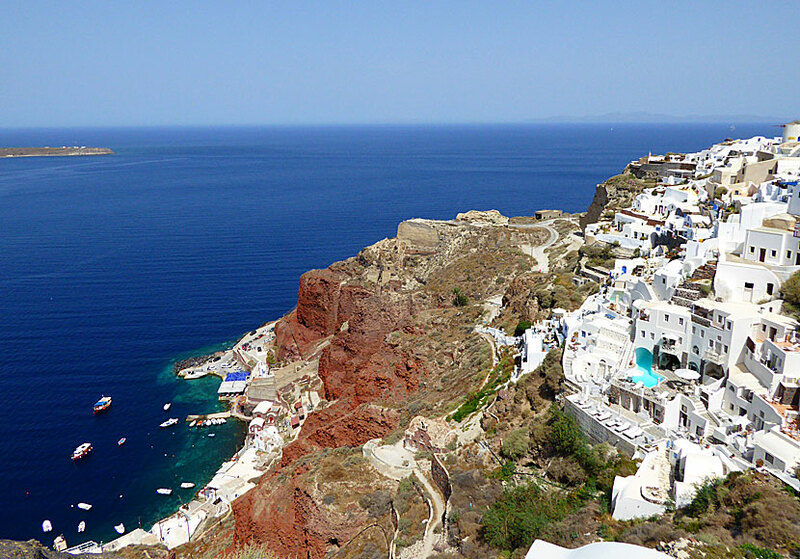 The view of Oia is one of the most beautiful among the Greek islands. Oia is not only renowned for its unique location, its beautiful architecture and photogenic churches and the sunset is at least as famous, Oia is filled evening after evening by incurable romantics that take photographs and admire the sunset. 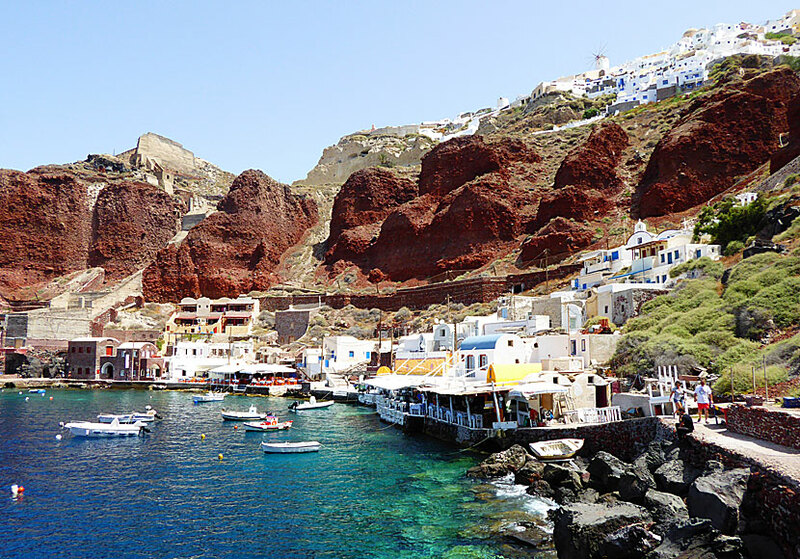 Below Oia lies the picturesque and charming port of Amoudia. Amoudia can be reached by a set of steps (avoid riding donkey) or by private vehicle. The road to Amoudia begins at the large car park in Oia. The waterfront in Amoudia is lined with fish tavernas, the cosiness is lofty. One would think that the tavernas are real tourist traps, but I've never been disappointed when I've eaten in Amoudia. The tavernas are specialized in fresh fish, but they also serve other food. The port of Amoudia and the village of Oia. If you like to swim off the rocks, follow the path round the corner to the left of the port, after just a few minutes you will reach an inviting bathing-place with rocks and crystal clear water. Off the bathing-place is a small island with an even smaller church called Agios Nikolaos. It is possible to climb up on the island and dive straight into the wonderful sea. The rocks in Amoudia under Oia. Fira in the background. 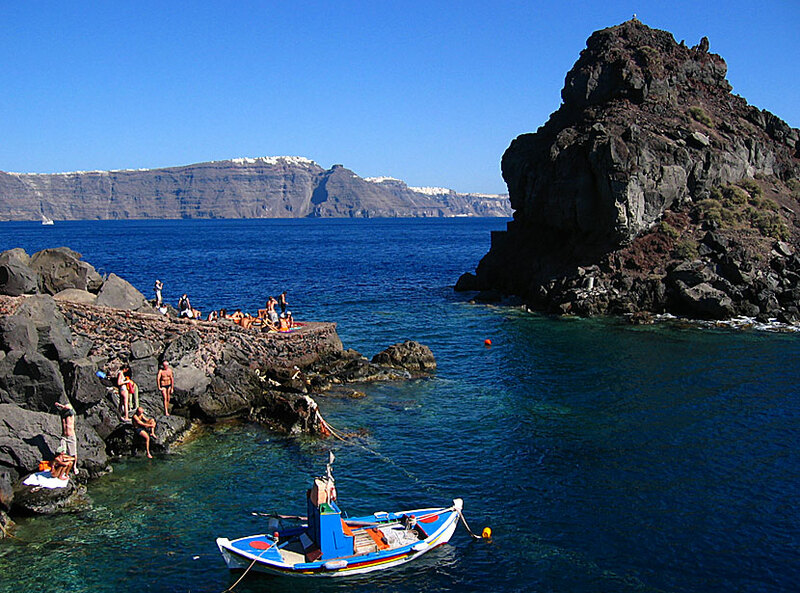 Do you like to snorkel, this is the best place in Santorini to do it. If you do not like bathing-places with rocks, just go to Katharos beach which is quite close to Oia. Just as in Imerovigli the difficulty is not to find a hotel, the difficulty is to choose hotel. The range is huge, and almost all of the hotels belongs to the higher price levels, although there actually are budget hotels too. Below are some suggestions.